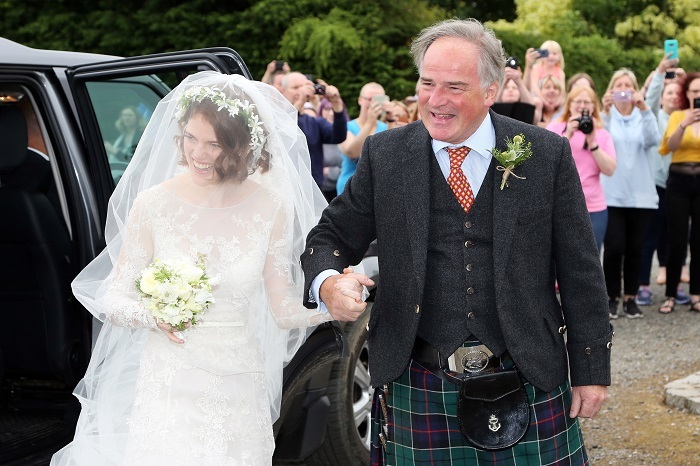 Game of Thrones stars Kit Harington and Rose Leslie tied the knot on Saturday in Aberdeenshire, Scotland. The couple, both 31, met on the set of the HBO series in 2012. On screen, they played the lovers Jon Snow and Ygritte. Their engagement had been announced in September. Leslie arrived to the church wearing an ivory long-sleeved gown with lace details. She wore a long lace veil with a floral garland atop her head and carried a small bouquet of flowers. Leslie arrived to the church on her father's arm. Her father wore a traditional Scottish kilt. The groom wore a black jacket, cream-colored vest, and striped pants. He greeted fans with a big smile before entering the church. Guests in attendance included Harington and Leslie's Game of Thrones costars Peter Dinklage, Maisie Williams, Emilia Clarke, and Sophie Turner. Dinklage plays Tyrion Lannister on the show while Clarke plays Daenerys Targaryen. Turner and Williams play sisters Sansa and Arya Stark. Turner is currently engaged to singer Joe Jonas. 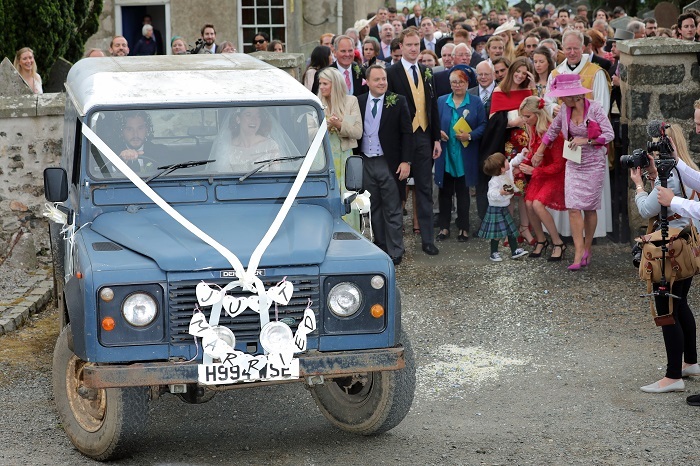 After the ceremony, guests tossed flower petal confetti and cheered as the couple made their way to an old Land Rover adorned with cans, paper hearts, and a "Just Married" sign. Everyone followed to continue to the celebrations at Wardhill Castle.